Place chocolate in a microwave safe bowl and microwave on half power for two minutes. Stir, then continue to microwave (on half power) in 20 second intervals, stirring after each, until fully melted and smooth. Stir chocolate into cream cheese mixture. Add walnuts and stir to combine. Pour in prepared pan. 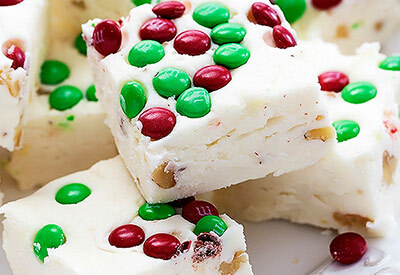 Sprinkle M&M candies on top. Cover and chill for 1 hour or until set. Cut into squares and serve or store in airtight container.